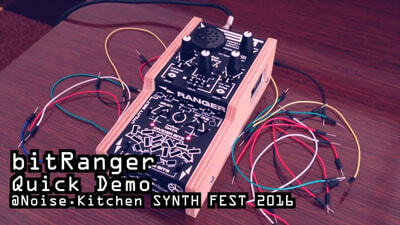 The bitRanger is a patchable analog logic computer which sculpts sonic worlds ranging from data noise to melodic arpeggios. While being a handheld standalone synth it is also right at home in the music studio. 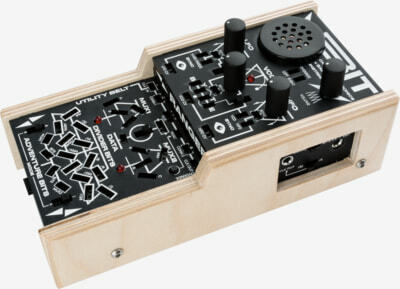 Extensive connectivity makes it so flexible that it can connect to almost anything: CV control its unique sound, sync it with drum machines and sequencers or use it as an algorithmic CV / GATE pattern generator. The patchbay of the bitRanger is a place for exploration where you can simply connect outputs to inputs to see what happens. This can be done methodically or with complete experimental abandon. Go nuts! Battery Power and a built in speaker make the bitRanger totally portable. Tweak it’s 4 knobs, 8 switches and more than 100 patch points in the woods, on the beach, on a train and in the studio.